Delta says that Naruto is also one of the monsters. Naruto crushes part of her foot, but Delta jumps back to dodge the rest of it. Her leg regenerates. The spike that stabbed Naruto is still stuck in his abdomen. Delta is getting arrogant and says, “Down on your knees already? That’s a bit of a letdown.” Boruto shouts but Naruto warns him to stay away. Delta is like, I will just kill all of them. Naruto starts getting really angry. He says that she will regret it for the rest of her life if she touches any one of the kids. Delta ignores her and pushes Naruto down. Now, she’s standing on his abdomen and starts talking. She says that she’s only interested in Kawaki but still she will kill Naruto anyway. 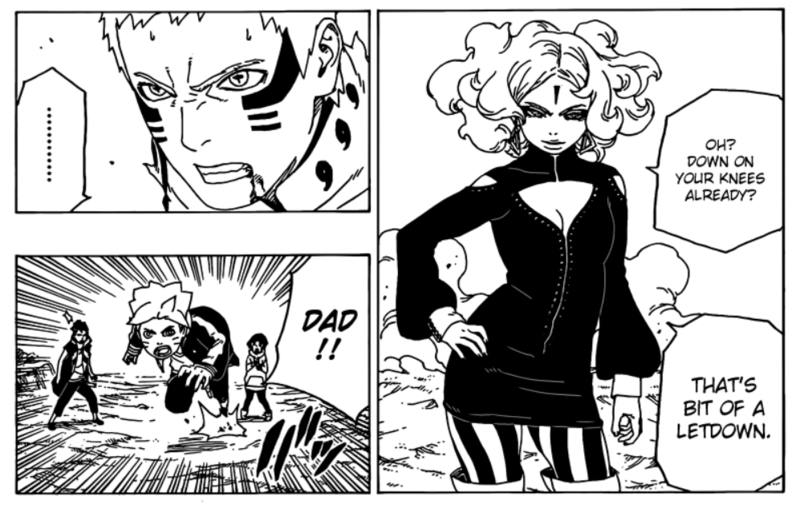 Naruto says that Kawaki’s included with them so she better not touch him with her filthy hands. 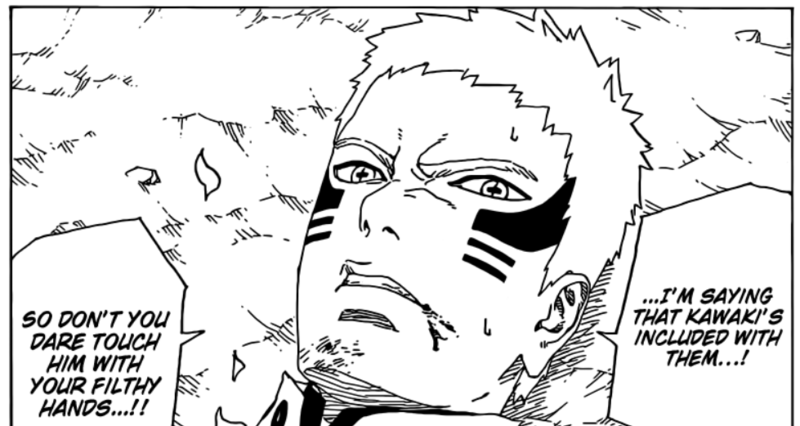 Delta just presses against Naruto’s wound and asks why is Naruto doing all this? Naruto replies with a question asking what’s the business with Kawaki that she’s so desperate to infiltrate in a village without any backup. Delta says that it means nothing to him as he’s just going to die in a while. Naruto just starts talking again about it and Delta removes the spike from his body causing him to scream in pain. Delta is angry as she caught Naruto’s trick as he was just trying to extract intel by playing the injured.